Improve your digital distribution by learning how to use metadata in Studio One. With so much music being delivered as downloads, the inclusion of good metadata in each file and the assignment of appropriate file names have become mandatory tasks. Studio One provides extensive support for metadata, which not only gets stored with the audio in file formats with established metadata structures, but is also drawn on to generate file names for files exported from the mastering side of Studio One, the Project page. There are several different places in the program where metadata is entered. Here's how it all works. Digital distribution is now extremely important to musicians, and this image shows why it's so vital for independent artists to learn to use metadata effectively. What you enter in Studio One directly affects how your listeners will view it on their system.This is how metadata affects your song down the line. filenaming etc...Your first opportunity to enter metadata shows up on the screen you see when Studio One boots up: the Start page. In the Artist Profile section of the Start page, four pieces of metadata can be entered: the artist's name, musical genre, a web site URL, and a photo. The information in these fields is used by default in other metadata repositories in the program. Song metadata is entered on the Meta Information pane of the Song Setup page in the Preferences/Options dialogue box. Choose Studio One/Preferences from the main menu bar, or simply press Command-[comma] or, in Windows, Control-[comma]. The metadata from the Start page appears as default info, but there are quite a few more fields here, including one for a copyright notice, a comment field, and the Songwriter, Composer and Arranger fields. You can set Studio One to show the Song metadata and/or the copyright notice every time you open the Song document, but I haven't yet had a reason to do so. You'll have been able to enter basic data on the Start page, and this appears by default when you add to your Song metadata.Since metadata is finalised and added to output files during mastering, Studio One's Project page houses the most extensive set of metadata in the program. 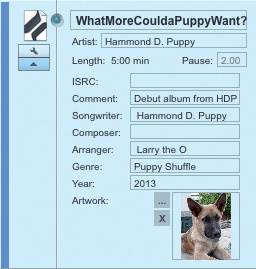 Metadata can be added to the Project as a whole, and to each individual track. At first glance, only three Project metadata fields make themselves known: Disc name (the name of the work, as opposed to the name of the Project document itself); the Artist name; and the Project length (which is read-only). But click on the exposure triangle below those fields and a whole bunch of metadata fields drop down into view. The very first field, right at the top of the advanced metadata section, is the biggest challenge. That field is called the 'International Article Number', or 'EAN'. No, I didn't mean to write 'IAN'. You see, it was originally called the 'European Article Number' and it appears that it was just too hard to change when it was redubbed with the 'International' moniker. So, now you understand the EAN field, right? Wrong. You see, EAN is actually a barcode, so the number you see in the EAN metadata field is not actually the EAN, but the GTIN or 'Global Trade Item Number', which is encoded into the EAN barcode. To use EANs, you must first register with the GS1 organisation in your country and get a company prefix. (GS1 are the non-profit group that administer the system. Find them at www.gs1.org.) Equipped with a prefix, you can generate a GTIN in the format specified by GS1, make a barcode that encodes the GTIN, and Bob's your cocker spaniel. Don't want to deal with it all? Bandcamp and other musicians' services businesses will do it for you. Now you understand the EAN field, I'm quite sure. The EAN field at the top — which, confusingly, stands for International Article Number — is confusing and therefore easy to ignore. But be warned that some digital download sites, like iTunes, won't accept a submssion without an EAN number.Fortunately, things get easier from there, as the rest of the fields are straightforward: Comment, Songwriter, Composer, Arranger, Genre, Year and Artwork. This metadata applies globally to the entire Project, so none of it is inherited from any individual Song. You have to enter data for any fields you want filled in. But don't go thinking it was a waste of time entering all of that Song metadata. When a Song is added to a Project, it becomes a 'track'. (It's a confusing choice of terminology, given that they are nothing like 'tracks' in the Song page and, in fact, the Project page is not a multitrack environment, but there you are.) Each track has metadata, and if you add a Studio One Song to the Project instead of just importing a file, the Song metadata (Title, Artist, Comment, Songwriter, Composer, Arrange, Genre, Year and Artwork) shows up as track metadata on the Project page. Song metadata becomes track metadata when a song is added to a project. (This is slightly confusing terminology that basically refers to adding a 'Track' to an 'Album'. )One metadata field not inherited from the Song is the ISRC number. Since ISRC is important and not well understood, I'll digress for a moment to describe it. ISRC, or International Standard Recording Code, is a 12-digit code that uniquely identifies a recording. It does not identify the composition, but the recording, so when you do the 'unplugged' version of your electronica masterpiece, you will assign it a different ISRC than the original version. ISRC is similar to ISBN, which is used to identify books. It can be used for rights and download sales tracking, and, in fact, is required by iTunes and many other digital distributors. Each track in a Studio One Project can be assigned its own ISRC, and ISRCs can be embedded not only in digital files, but on CDs as well. But who assigns ISRCs? Either the rights owner (usually you) or a designated representative of the rights owner registers with the ISRC agency in their country, and is issued a Registrant Code in return, much like the EAN process. And, also as with EAN, this code forms the basis of any ISRC that registrant is now authorised to issue, up to 100,000 codes. Registering yourself is usually a simple process that may involve a modest one-time fee ($75 in the US, for example). If you don't want to deal with tracking and managing ISRCs most musicians services businesses (distributors, labels, and even Nimbit, PreSonus's own musicians services company that is tightly integrated with Studio One) can do it for you. One other thing to note on the general topic of metadata, before getting back to Studio One metadata features, is that there is not broad standardisation of metadata across different file types and media. 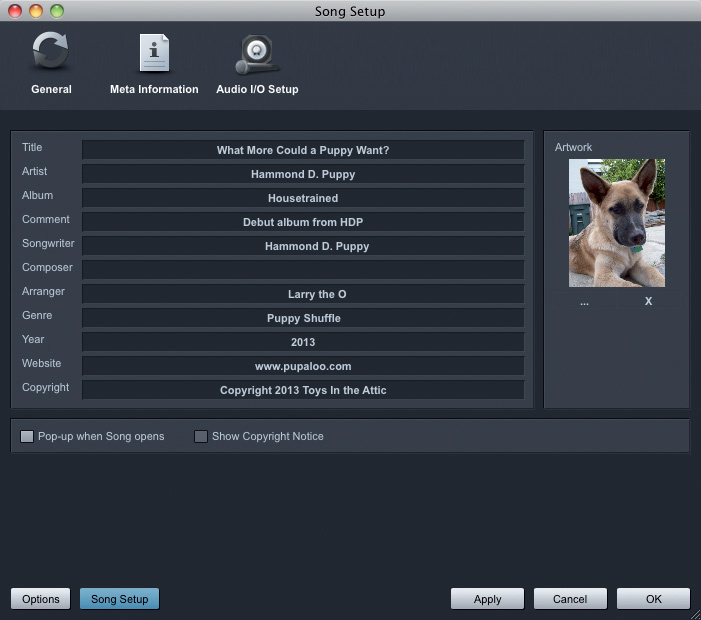 Most people have heard of the MP3 format's ID3 tag system, but other formats, such as Ogg Vorbis, AIFF, Broadcast WAV, FLAC, and AAC, have their own provisions for storing metadata, too. However, they might not store exactly the same metadata as MP3, or use the same storage scheme as another application that writes the same metadata to the same kind of files. While there is much blather to be seen in online forums about which file formats have metadata capability and which don't, the real answer is that they pretty much all do, and the issue is actually how broadly any given scheme is implemented. For most users, compatibility is the heart of the matter: if the metadata doesn't show up the same wherever they play the music, it's not of much use to them. For you as a content creator, that means following the trail wherever it leads, to make sure your metadata is stored in the most popular way for the release format you've chosen. For example, from my bit of quick research, it appears that Studio One writes metadata to MP3, Ogg, and FLAC files, but not to AIFF or WAV. In addition to embedding metadata in files, Studio One also uses it for file naming. The Digital Release option for exporting Projects exports each track in the Project as a separate file — the method you will usually use to create files for downloading. But the scheme it uses takes a bit of explaining. 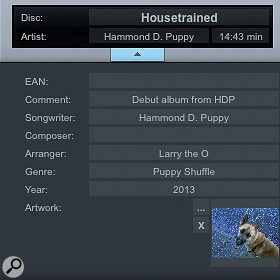 Digital Release creates a folder and exports each track to a file in the folder. I'm going to assume, for this discussion, that both of the naming options in the Digital Release export dialogue — Tracknumbers (sic) and Artist Name — are selected. The folder name will start with the artist name, followed by the contents of the Project Disc Name field. If the Disc Name field is blank, however, Studio One will instead use the name of the Project document. The file names will consist of the track number (when that option is selected), followed by the contents of the track's Artist Name field and the Track Name field. When there is no track artist name, the Project artist name is used; when there is no track name, "(Unknown Title)” is used. You can see that if you fill out Song metadata, it can carry through all the way to the final, exported file names. Metadata is certain to become more, not less, important as time goes on. The easiest thing to do is make entering metadata a standard part of your process that starts from the moment you create a new Song document. There are some odds and ends to take care of, like entering Project metadata that may be the same as Song/track metadata that's already been entered, and obtaining ISRC and EAN/UPC codes. But the rewards are great. Firstly, people who listen to your music know what it is and who made it and, secondly, online distribution and rights tracking is possible.